Mental health in the military is taken very seriously, not just for the admission into the services, but also staying in the services as well. 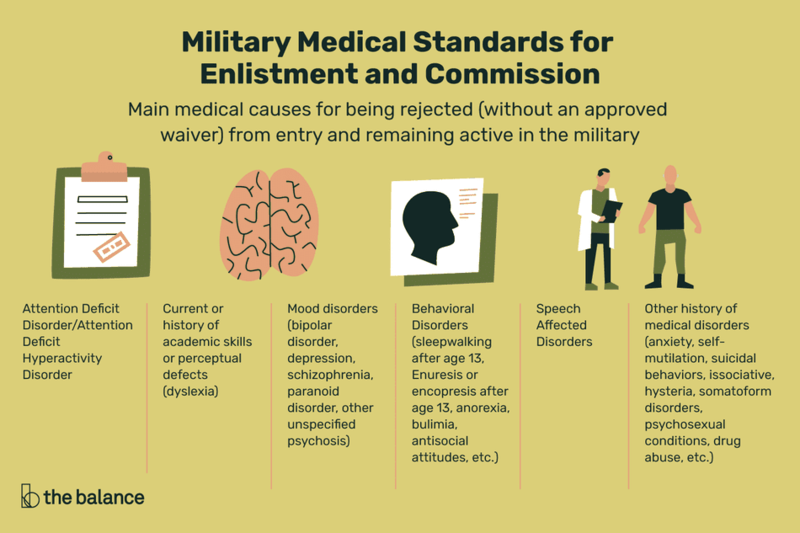 There are many disqualifying medical conditions to entry and continued service into the military, including several that concern mental health and illness. Attention Deficit Disorder/Attention Deficit Hyperactivity Disorder or Perceptual/Learning Disorder(s) (315) is disqualifying unless the applicant can demonstrate passing academic performance and there has been no use of medication in the previous 12 months. Newer regulations may allow for waivers on a case-by-case basis. Current or history of academic skills or perceptual defects secondary to organic or functional mental disorders, including, but not limited to dyslexia, that interfere with school or employment, are disqualifying. However, applicants demonstrating passing academic and employment performance without academic and/ or work accommodations at any time in the previous 12 months may be qualified. Current or history of disorders with psychotic features such as schizophrenia (295), paranoid disorder (297), and other unspecified psychosis (298) is disqualifying. Mood disorders such as depression, bipolar disorder, psychoses, and other unspecified depressive issues are disqualifying. Any history of mood disorders requiring medication and/or outpatient care for longer than six months by a mental health professional is also disqualifying. Also, any symptoms of mood and mental issues that affect social ability, school, and learning, or work efficiency are disqualifying. Current or history of adjustment disorders within the previous three months is disqualifying. Behavioral disorders history in school and with law enforcement agencies having to get involved due to dangerous behavior to self or others is disqualifying. Antisocial attitudes or behaviors are disqualifying as people who exhibit these symptoms are typically not adaptive to military service. Any history of personality disorder that is demonstrated by documented and recurring inability to remain in a school environment, work with employers or fellow employees, social groups are disqualifying. Any psychological testing that reveals a high degree of immaturity, instability, personality issues, impulsiveness, or dependency will also interfere with the ability to conform to the rules and regulations of the Armed Forces is disqualifying. Enuresis or encopresis after the 13th birthday is disqualifying. Sleepwalking after 13th birthday is disqualifying. Eating disorders such as anorexia, bulimia, or other unspecified eating disorders lasting longer than three months and occurring after the 14th birthday is also disqualifying. Any speech impediment, stammering, stuttering or other receptive or expressive language disorder that may significantly interfere with the ability to repeat commands is disqualifying. Any history of suicidal behavior, that includes discussions, gestures, or the actual attempt is disqualifying. A history of self-mutilation is also disqualifying. Anxiety issues, either current or historical, or panic, agoraphobia, social phobia, simple phobias, obsessive-compulsive disorders, other acute reactions to stress, and posttraumatic stress are disqualifying for entry into the service. Any history or current disorder of being dissociative or de-personalization are disqualifying. Any history or current somatoform disorders, including, but not limited to hypochondriasis or chronic pain disorder, are disqualifying. Any history or current issue with alcohol dependence, drug dependence, alcohol abuse, or other drug abuse is disqualifying. Of all the medical issues that disqualify a person from being in the service, the mental health side is most rigid in its stance, even if some diagnoses can be highly subjective. Does Drug Use Disqualify You From Military Enlistment?